On Friday, the rich boxing heritage of Philadelphia begins its next chapter when fighters and fans descend on the historic 2300 arena for a night of action-filled fights when Raging Babe Promotions presents Philly Special. 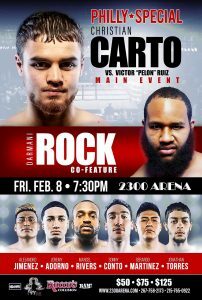 Promoted by Raging Babe Promotions, the card will be headlined by bantamweight Christian Carto, who won by unanimous decision in November against Pedro Antonio Rodriguez, looks to take the next step in what has already been a promising career as he puts his undefeated record on the line against Victor Ruiz of Mexico. Poised to be the heir apparent in a long line of Italian-American champions, Carto will pull out his full arsenal of tools in route to what he hopes will be an impressive win in front of his hometown crowd. Tonight’s card is SOLD OUT. Michelle Rosado, President of Raging Babe Promotions says she warned people weeks ago they tickets would go as Philadelphia shows up and shows out on fight night. Heavyweight Darmani Rock (13-0, 8 KO) vs Steven Lyons (5-3) of Louisiana. Fans who missed out on tickets can watch Friday night’s action online courtesy of event partner Fight Night Live Powered by Everlast with the first bout is scheduled to begin at 7:30 EST. Created and produced by Linacre Media out of New York City, the FIGHTNIGHT LIVE series features professional announcers, multiple camera angles, television graphics, replays and behind-the-scenes access and interviews. The streamed shows are available globally wherever Facebook is available. The platform, which To Access Fight Night Live, click HERE.